"Easwaramma was the chosen one. I chose her to be My mother. That is the intimate relationship between Mother Easwaramma and Myself." 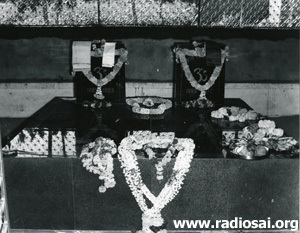 That was the emphatic declaration of Bhagavan on the most auspicious Easwaramma Day, the 6th of May, 2001. In no uncertain terms Swami communicated how lofty, grand and glorious is the stature of Mother Easwaramma. The thronging crowd in Sai Ramesh Hall exploded into loud applause that evening as they heard these Divine words from Bhagavan. Mother Easwaramma, truly, was a divine effulgence which graced mother Earth with a sacred mission and purpose by the inscrutable will of the Divine just like Kaushalya, (Mother of Sri Rama), Devaki (Mother of Sri Krishna) or Mary (Christ's Mother). She underwent similar agonies and ecstasies, fears and dilemmas, trials and triumphs, and ultimately bliss and beatitude that the Divine Mothers of yore passed through. Like Krishna, Swami was the eighth child of Mother Easwaramma and the turbulent times she went through before he took birth were akin to what Devaki experienced before Krishna graced her lap. None of Mother Devaki's previous seven children could escape from the heinous designs of the demon Kamsa. Easwaramma too suffered at the hands of cruel fate. She had four miscarriages in a row before the Light of the World descended as her Son. Kondama Raju, the grandfather of this physical body, being a jnani (one of wisdom), was blessed with a vision of the future. One day he called his son, Pedda Venkama Raju, and told him to change his wife's name to Easwaramma. He told this because he felt the divine vibrations originating from within. His intention was to convey that she was the mother of Easwara, God Himself. But Pedda Venkama Raju was not aware of the inner meaning of this name. He implicitly obeyed the command of his father and changed the name of his wife to Easwaramma. Easwaramma was first christened as Namagiriamma at the time of birth. So long before Swami was born, Namagiriamma became Easwaramma, meaning the Mother of Easwara, or God, and in his own inimitable way the Divine Lord announced his coming advent. Many years later, a Pundit well versed in the Puranas asked Swami, "Was your Incarnation a Pravesa (an Entrance) or a Prasava (Enceinte)?" Turning to Easwaramma seated in front, he said, "Tell what happened that day near the well after your mother-in-law had warned you." She had dreamt of Sathyanarayana Deva and she cautioned me that I should not be frightened if something happens to me through the will of God. That morning when I was at the well drawing water, a big ball of blue light came rolling towards me and I fainted and fell. I felt it glide into me. "There you have the answer!" Swami said, "I was not begotten. It was Pravesa, not Prasava." So it was the Divine had decided to descend and had chosen the womb of Mother Easwaramma as his temporary abode. When the sacred moment arrived in the early hours of the morning on that holy Monday, the day dedicated to Lord Shiva, on the 23rd of November 1926, the Chosen Mother had just consumed prasad (consecrated food) given to her by her mother-in-law after the hour-long Sathyanarayana Puja. A mat covered with a thick bedspread had been placed in a corner of the room, when the labor had begun, and now the baby was placed on it by the grandmother. Suddenly they found the bedspread rising up and falling down on either side of the baby. She grasped the child and held it close. A serpent was coiled beneath! Of course, snakes there were in plenty at Puttaparthi, creeping through crevices, crawling along the walls, and hiding in holes. But a serpent in the lying-in room pretending to be a bed – it was the role of Adisesha for the Vishnu who rested on its coils. This was the Incarnation's first miracle. When Easwaramma was asked about this epic event, she confessed she had been so filled with joy at the birth of a son she had never even noticed the agitation all around. 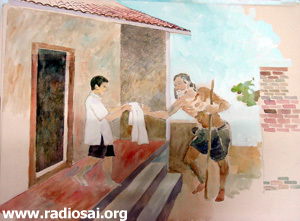 He [Sathya] never asked for any particular food or clothes. A bundle of clothes would be brought from Hindupur or Anantapur and one of the grownups, father or grandfather, would call the boys in the family asking each one to choose for himself. But Sathya always sat aloof until the others had made their choice and then he would take whatever was left behind, rejected by the others. He never seemed to have any desire or wish of his own, but his face would light up with a beam when he saw the other children happy. When we asked him what he wanted, a smile was the only reply. I would hug him close and try to get him to confide his wish to me. This was something I could not understand. How were we different? What made him so deeply sober and serious? I began at last to wonder whether the label Brahmajnan [a realized soul] the village elders had stuck on him and which I had thought a mockery was indeed a tribute after all. Like Yashoda, Sri Krishna's foster Mother, Easwaramma would often pray for Divine intervention for Sathya to turn into a normal Puttaparthi boy. Still, Easwaramma could see in him the potentials of a poet, a singer, a dancer, a playwright and a director and she hoped he would blossom in these fields. In fact, such were Sathya's theatrical skills and such was Easwaramma's simplicity that whenever she saw him being "tortured" in a drama he acted in, she wept aloud and even tried to protect her Sathya! Those days I used to sleep all alone in a thatched hut. That night, as Easwaramma feared, some evil-minded people set the hut on fire from all four sides. There were raging flames all around. Seeing this, Subbamma and Easwaramma came running. When they reached the spot, they found to their utter amazement there was a heavy downpour on the hut. However, there was absolutely no rain in the surrounding area. When I came out of the hut, both of them were overjoyed to see Me safe and sound. One day, somebody invited Me to their house for food. Actually their intention was to poison Me. They were feeling jealous of My growing popularity and prosperity. In those days I used to relish vadas made of Alasanda grains. Hence, they mixed poison in vadas and offered them to Me. Before going there, I had told Easwaramma and Subbamma not to be afraid if any untoward incident was to happen. When I returned from there, My entire body turned blue and My mouth started frothing. I told Easwaramma to wave her hand in a circle. She did accordingly, and to her utter amazement there appeared vibhuti in her hand. She mixed it in water and gave it to Me. Instantly, I became normal. She wondered, ‘Swami can create vibhuti with a wave of his hand. But how is it that vibhuti appeared in My hand?' In fact, I had given her that power for that moment. Easwaramma went through many trying times mothering the "infinite power" incarnated in her humble home, though of course there were also mystical and profound experiences. When Sathya was just nine months old, one singular episode baffled her beyond her limits. Easwaramma would be blessed with countless such experiences and every one increased her love for the beloved son she had been gifted with after so much prayer and penitence. Sathya was so bright that denying him further education seemed a sacrilege, so as there was no high school within a radius of twenty miles he went to live with his brother so he could attend school at Uravakonda. Easwaramma had to sigh and cry alone, and it must be added, now and then to exult and enthuse, for stories seeped through the intervening miles of the marvels Sathya had authored, the cures he had effected, the problems he had solved, as well as of the hardships he had to undergo. During a visit to Puttaparthi from Uravakonda, Easwaramma gave Sathya an invigorating "oil bath" and observed on his left shoulder a broad length of blackened thickened skin. Sathya did not complain of pain when the patch was touched or pressed and laughed it off when she asked how he had acquired that mark. 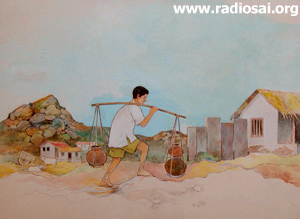 But when Easwaramma insisted, he told her that the skin was rendered so as the result of carrying water pots hung on both ends of a pole borne on his shoulder for the household where he stayed. There was only one well at Uravakonda for drinking water which was nearly a kilometer away, so he walked to and fro about six times daily, thrice in the morning and thrice in the evening. Easwaramma was alarmed. "You must come away from there. They are exploiting your goodness and your desire to serve. Why should they depend on you for water?" But Sathya responded, "I felt it as my duty, Amma. How long can the children survive on the brackish poison? I carry the water of life from that distance gladly, Mother. I have come to do this service." Mother was in tears and could hardly speak. Immediately, Sathya was back home in Puttaparthi. If Swami was away from her for some time and a visitor came from that place, Easwaramma would invariably ask, "How is Swami? Is he keeping well? Does he eat anything at all?" 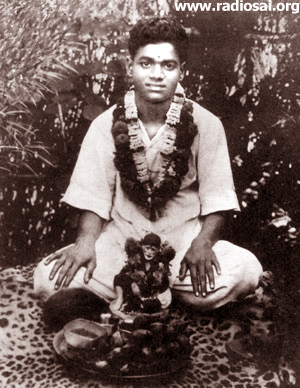 Swami's eating habits were always a subject of concern for the Mother. Every now and then Easwaramma would go into the Mandir, for there were no regular hours for her or anyone else, and she would note the new arrivals, talk to them and then move quietly towards the women who were mothering her son. "Serve him and nurse him with care," she would plead. "Look at him; one can count the ribs, they are coming through so clear. He won't listen to what we say. He insists on his own ways, all the while telling us how to behave. And somehow he justifies everything he does as good for himself." Noon and night, lunchtime and dinnertime, whenever she thought about it Easwaramma was confronted by a conundrum. How could the Ananda of others be Ahara [food] for him? He ate so meagerly. He relished so little. He set aside so much. He had no obvious preference, no visible appetite, no taste to satisfy, no hunger to appease, and no time to spare. How could he derive sustenance from this Anandaless atmosphere? She prayed for him to eat but it was all in vain. Swami would take a mouthful just to satisfy her and then stand and walk away. It took Easwaramma a long time to reconcile herself to this Avataric trait. Whenever she was around she personally supervised the preparation of the menu for Swami by going into the host's kitchen. She believed that Swami would eat a few more spoonfuls if the cuisine was Telugu, or better still, if it was genuine Rayalaseema, the region to which Puttaparthi belonged. 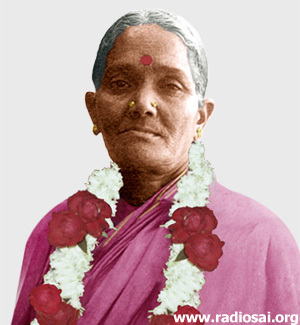 When Swami was at Jamnagar with the Rajmatha of Nawanagar (in Gujarat), Easwaramma feared that the Gujarati dishes might not be acceptable to her son. She smuggled herself into the palace kitchen and sought permission to prepare a little chaar – a soup based on boiled pulses – so Swami would have some food of familiar taste. This mother's concern never left her alone. Her eyes were on his plate to discover how much he tasted of what and how his health reacted to the restraints he imposed on himself. When Bhagavan was forty-four-years-old, Easwaramma was heard to say, "He does not like their cooking. He used to eat well as a boy when I cooked his food. But he does not care for my cooking now. He says I must have rest and quiet and not to worry about such things." When Swami was a child, Easwaramma would have to spend an hour to persuade him to swallow a mouthful. The thinnest of excuses – a crow cawing for a morsel, a mendicant voice from afar, a child crying next door – sufficed for him to run away from the plate before him. 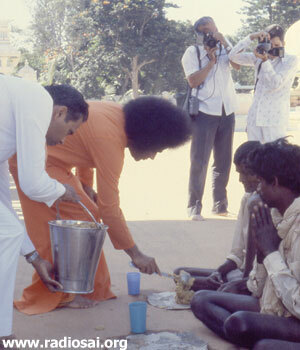 On one occasion Swami took to drinking only a cup of buttermilk per day…for thirty-six days! One can imagine the heart-rending pain Easwaramma went through, struggling to hold back tears which threatened to well up throughout the day. When at last Swami said in response to the devotees' prayers he would resume his normal schedule of breakfast, lunch, and dinner, Easwaramma was happy beyond words and asked him to never tease them with such tactics again. Even years later, whenever she recalled those thirty-six days, it was with a sigh and expression of resignation. Mother's concern for Swami extended to every detail of his life. Apart from his spartan food habits, another subject which troubled her was Swami's travels. She was always apprehensive of him leaving Puttaparthi even if it was for only a day to a nearby city or town. So imagine her distress when she heard about the planned trip to East Africa in 1968. She was extremely nervous, to say the least. Not much was known about Africa in those days, and the popular impression was that it was a dark continent full of wild animals, savages, and cannibals. Easwaramma had heard this folklore and feared Swami would be in danger if he went there. She resolved to have the trip cancelled and expressed her reservations to someone involved with the expedition. The person replied, "Mother, do not worry. Swami will be visiting only big cities where he will be absolutely safe – no threats from animals or savages there!" Easwaramma was dissatisfied with the reply and felt hurt that the person was making light of a serious matter. She approached someone else and told him, "Listen, all of you are merrily planning a jaunt to Africa without being conscious of the risk to Swami. It is not too late yet, and you must do everything possible to dissuade him from undertaking this trip." The person she spoke to gave a patient hearing and then replied, "Amma, have no fear. Swami will have very high security protection." Easwaramma felt frustrated that no one was taking her misgivings seriously. She sought out a senior devotee and conveyed her worst fears to him. This devotee said, "Mother, it is true that there are many dangers in Africa. But how can they affect Swami? He is God, is he not?" Hearing this Mother Easwaramma became furious and shouted back, "You fool! 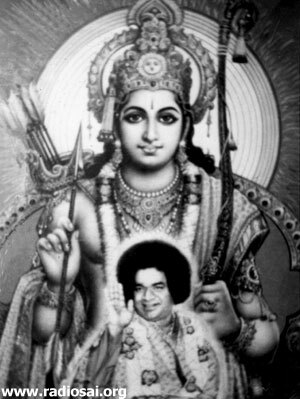 I know Swami is God and you know he is God. But do those savages and wild animals in Africa know he is God?" I knew the Divine Mother Easwaramma so well. It was mutual love between us. I loved her because on her face there was such brilliance that you could not find anywhere in the whole world on any sophisticated face. Whatever one would put on the face it could not match the glow on her face. I have seen it myself. She was as simple as a child. Ask any of those old timers who knew the Mother and they will say, "She was so humble, so lovable, so simple." Swami, who was filled with compassion at Easwaramma's rustic upbringing, believed that travel was the surest way to broaden her views. 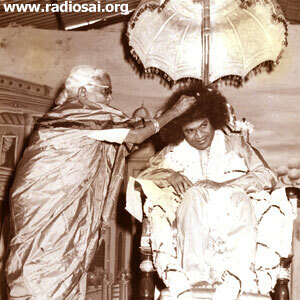 Swami persuaded her to come with him and the devotees to Bangalore. Fast cars sped them along macadamized highways, through stretches of brown barrenness, and then carpets of cool green, jowar, paddy and ragi, sweet sugarcane and cotton. At Madras she saw the sea for the first time. Swami had described the ocean to her in epic terms, for these were the waters that Rama and his monkey hordes had crossed in the Tretha Yuga on their way to Lanka. A few drops sprinkled on the head purifies a person to perfection, he said, for into it flows the holy rivers Ganga, Jumna, Kaveri and Godavari. Easwaramma was touched to the depths of her being as she gazed in awe at her first vision of the ocean, boundless in its immensity, eternal in its rhythm of surge and swell, forever changing yet ever the same, an endless expanse with the horizon as its limits, the sky as its roof, and the subtle colors of space – blue, deep gray-green, cloudy-white. She burst into an exclamation of wonder that this was the very Mirror of God reflecting the majesty of his many moods. For the first time Easwaramma knew the hurry and scurry of cities, the noise of bazaars. She greeted lions and tigers, pythons and peacocks, and those most strange creatures, the giraffe and the kangaroo, at the Mysore Zoo. She enjoyed the cool comfort of Bangalore and weathered the biting cold of Ootacamund on the Nilgiris and the Blue Mountains of Tamil Nadu. She visited the fabled temples and sacred rivers of India, while Swami showered his constant attention upon her. This was his special grace, she knew, for she had not yet completely severed her maternal attachments and soared into the blissful freedom of supreme trust and devotion. Easwaramma would often be a part of the troupe accompanying Baba to remote spots in Andhra Pradesh and other parts of India and would ride in the car following Bhagavan's. During the summer months these excursions could become unbearably hot and Swami would ask her to relax in his car to be cooled in the air conditioning but she always politely declined the offer. Easwaramma never hankered for physical comfort and was satisfied with the way things were. When Swami and his devotees left Lucknow for Benares, the Secretary to the Governor drew up the order of precedence according to protocol for the entourage of cars: the pilot car with Swami and the Governor, the Police car, the Rolls Royce with the parents, the Secretary's car, the car with the Editor of the Sanathana Sarathi, and so on. Easwaramma, however, preferred to ride in the van with her sister devotees whom she could regale with her colorful anecdotes to the lonely luxury of the Rolls Royce. In 1956, a sanyasi and learned scholar, Swami Amrithananda, came from Thiruvanamallai for Swami's Darshan. He had lived with the great master Ramana Maharshi for a long time and Swami invited him to stay for several months in Puttaparthi. 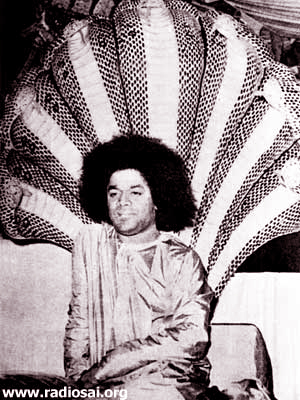 As it was Dasara, Swami was blessing the devotees with discourses every day. 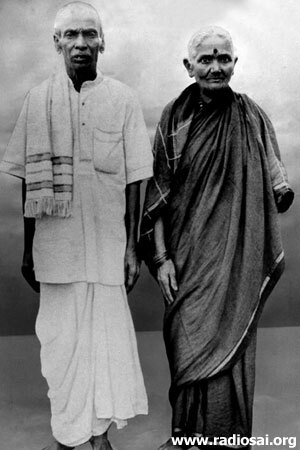 During one such discourse, Easwaramma asked Swami Amrithananda in Telugu, "Ememo cheputhu unnade, sariga cheputhada?" meaning, "He is telling so many things. Are they all correct?" That was the motherly concern of Easwaramma for Swami. Though she had seen many instances of Swami doing the impossible, yet her heart was always anxious and her lips silently praying for her son's welfare. Then there were the village rumors: "This is not going to last long," "Sai Baba's powers will soon be drained away," etc. Whenever such gossip assailed her ears she would pull out from the private treasure trove of her memory remembrances of the incredible events she had witnessed bearing testimony to the authenticity of the Avathar that was now before her. On that occasion when Swami Amrithananda replied, "Amma, he is Parabramha. He knows everything. He is my Guru and God," it was yet further confirmation to her of Baba's divinity. When Swami made plans to visit the holy sites of the Himalayas, Easwaramma became alarmed that her son might fall victim to black magic motivated by religious rivalry from the yogis and monks of that area. She confided her reservations to Professor Kasturi and he calmed them by promising to recite the Gayatri mantra and invoke its protective powers. Then Kondama Raju said, ‘O mad woman, still you are deluded by the feeling of a mother toward her son! Look there, God is coming.' So saying, he pointed at Me as I was entering his house. She too was aware of My Divinity but she used to get carried away by her motherly affection toward Me. Similar was the case with Yashoda. Though she had seen all the fourteen worlds in Krishna's mouth, she thought it was a dream or an illusion. Yes, there were many occasions when she vacillated between being a mother and devotee. The transition from doting mother to adoring devotee was a long and tortuous path as her son was revealed as the Source of divine light shining his benediction on humanity. Just picture this scene as the anxious parents had rushed to Uravakonda to visit Swami, who was then still a mere lad. They were confronted with a large crowd of devotees who cheered them as, "Matha Pitha ki jai," (Victory to the Parents!) close on the heels of each full-throated "Sai Baba ki jai" (Victory to Sai!). Sathya was seated on a chair with flower garlands piling up on his right as he accepted each one that was offered and added it to the mound. But when pressed to identify his parents, Sathya said concisely, "They are Maya" [illusion]. "Maya!" exclaimed Easwaramma, and fell in a faint. When she came back to her senses she sat by Sathya's side, tears coursing down her face, for her son was but a shadow of his former self though only three months had elapsed since she last saw him. "Sathya, speak to your mother!" she begged. A few minutes of silence ensued. Then, "Who belongs to whom?" asked Sathya, remote and cold. It was not a question but a pronouncement. Baba continued with her lesson. "It is all Maya, it is all Maya." Her only consolation was when Sathya agreed to eat some lunch. She finished serving and nervously signaled that her offerings be accepted. With a swift movement Sathya swept all the food into one mass and rolled it into three balls. "Maya! Maya!" he kept repeating. Someone told the stupefied mother that Sathya was bidding her come near and she moved a few feet forward. He put one of the balls of food in her right palm and kept his palm before her to receive it. As she gave it back, Sathya ate, whispering, "Maya is gone, Maya has left." 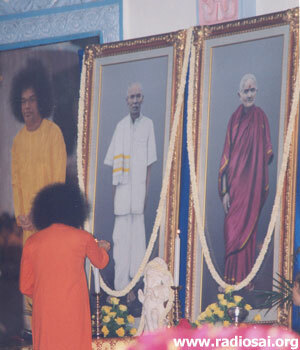 This scene is unique in the annals of human experience, for who can fathom what Easwaramma must have felt in her heart – nothing could have prepared her for the jolt as her little Sathya became Sai Baba, Guru to the whole world. She alone bore the brunt of this metamorphosis of her dearest Sathya to a discreet and distant Sai Baba. As the years went by Easwaramma had to adjust to many other changes that followed the ever-growing glory of her son. She strained to retain whatever contact she could as Swami's time became taken up by the needs of the devotees. "Swami, what is this I hear? They say you are going to build a new Mandir on that hill. How can you go to a spot that is so far from the village, a place that is surrounded by jungle and filled with snakes and scorpions? How will people who are old and sick and mothers with tiny children get to you? Aren't you going to bother hereafter with their troubles? Are you going to deny them your Darshan? What of the fate of those who come to you in the future? You have the mark of the wheel [the chakra] under your foot and you will never stay in one place!" she went on agitatedly, "You must always be climbing a hill or crossing a river to find a place to sit singing bhajans. Which godforsaken place have you found now? Don't you know that you must consult astrologers before you think of moving anywhere? And, listen to me," she warned, "this Mandir is enough for you. It is better to have a small place that is filled with people than a huge building half empty!" There was no interruption to this torrent of protest. Swami sat in patient silence letting her have her say and merely smiled at the end of it all. "Speak to me! Tell me something in reply!" she exclaimed at last in vexation. Swami softened. "Why do you bother with people's talk?" he gently asked and assured her, "There will be no jungle and no snakes when I go there. There will be hundreds of pilgrims pouring in every day – and that place will become a Shirdi, a Tirupati, and a Kasi." Stumped by this ringing pronouncement, Easwaramma fell back on her eldest son as her Court of Last Resort. 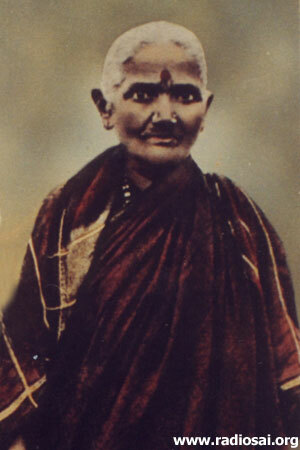 Swami must be persuaded to contain himself within the Puttaparthi Mandir, she pleaded. Seshama Raju wrote to Swami voicing their protests, but the letter he received in reply rendered them even more breathless. Such immeasurable audacity from a mere sixteen-year-old! He was not to be considered a "son" any longer, Sathya wrote. It was the result of his own will that he had come as man among men in order to liberate all, both the good and the bad from misery. He went on to claim that millions from the four quarters of the world will come seeking him and soon those standing at the far edge of the crowd would consider themselves lucky if they could but get Darshan of an orange speck in the distance. "Millions will come? Here? Where would they stay or stand?" Easwaramma wondered as she sent up frantic supplications to the gods to solve this conundrum of strange events that threatened to overwhelm them all. Though she witnessed Swami's miracles in the company of others, her response was typically more anxiety rather than awe. She calculated that one miracle would lead to another, for those attracted would clamor for it again and again. She feared that every miracle would drain Swami's spiritual power. A few townsfolk had whispered in her ear that his power would not last long for he was using it up at a fast pace. She had dared to warn Swami once or twice about this prospect but had received in reply only a loud, "Bah! I must make everyone happy. I have come for this, to lead the poor and the miserable into Ananda. Their Ananda [bliss] is the food that sustains me." Still, Easwaramma was apprehensive of the growing number of devotees and losing her Sathya. 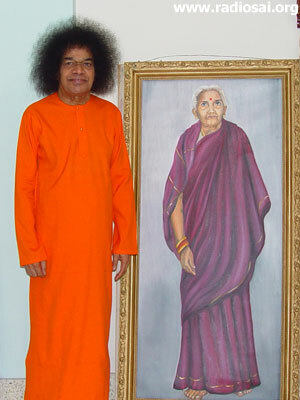 On the eve of His ceremonial move to the new Prashanthi Mandir in 1950, she seized the opportunity and secured a boon from Swami that he would have his dining room on the east side of the upper floor even though he had chosen the rooms at the other end in which to live. Swami was very strict in enforcing the rule that men and women must keep apart, so while the men used the staircase at the west end, Easwaramma and her daughters climbed up the one at the east side and spoke to him there. They were no longer allowed free entry into his apartment. They would be waiting and waiting anxiously in the dining room and only when they were almost desperate would he come, sauntering along the veranda. He came to give Darshan and not really to eat. Sitting at the small table he would finger one or two of the carefully prepared and nervously offered items, utter a few replies to their questions and rise, humming a tune, to return to the quarters now inaccessible to them. Swami, like Shirdi Baba, allowed devotees to place offerings on the table, but the hope that he would eat something from these was a vain one on most days. The easy familiar days at the old Mandir were gone forever. 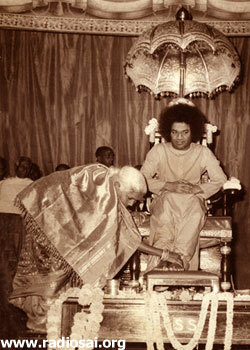 But Swami, in his compassion, granted Easwaramma a few minutes of access to him whenever she needed the healing touch of his vibhuthi or relief from routine. Easwaramma, like many of her sisters and brothers, was pestered by follies and fears when worldly desires clashed in conflict. Swami guided her into the realm of happiness, goodness, and wisdom. He raised her whom he had chosen as the Mother to the status of his foremost pupil and led her from perplexity to preeminent faith in the Divinity that deludes us as diversity yet stands ready to help pierce the veil of Maya and realize the Eternal Truth behind the game of life he so enjoys playing. Maharani of Mysore, coffee planter Sakamma, and Desaraj Arasu, the maternal uncle of Mysore Maharaja, were among those who used to come here [in the 1940s]. One day they prayed, "It is difficult for us to come here often. Hence, please come and settle in Mysore. We shall build a big mansion for You. "I told, "I don't want palatial buildings. I want to be here." That night, Mother Easwaramma came to Me with tears in her eyes and said, "Swami, people want to take You here and there for their selfish purposes. If you leave Puttaparthi I will give up my life. Please promise me that You will remain in Puttaparthi forever." I gave her My word that I would never leave Puttaparthi. This is why I have constructed many buildings in the Ashram for the comfort and convenience of devotees. So it is the Mother to whom mankind owes Swami's allegiance to his birthplace and his gift to us of a beautiful and sublime ashram and temple which have now become a spiritual lighthouse for the entire world. In fact, as time passed, Mother herself found it increasingly irksome to live in her village home. She could not endure the pettiness of caste-bred conflicts and began to sense more and more pollution in the village sky. Scandal, slander, eavesdropping, trickery, and teasing were the sport of the disbelievers. 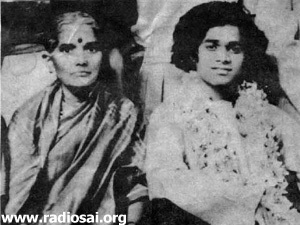 Mother found the atmosphere suffocating and with Swami's permission stayed within the premises of Prashanthi Mandir. Swami arranged for her to reside in a small cozy room on the ground floor of the Mandir itself and she felt very comfortable in the company of women devotees, guiding, encouraging, consoling and caring for them. Easwaramma had a soft heart especially towards women who were widowed by fate and ostracized by society as if their misfortune was infectious. She also sought out young women deserted by their husbands and left alone and helpless. Many such women were brought by their parents or kinsmen so that they might recover from the shock and renew their lives. She discovered that a large number of women who were brought to Puttaparthi were afflicted by "ghosts" and these victims of dark spirits were amenable to the softness and sweetness that emanated from her heart. 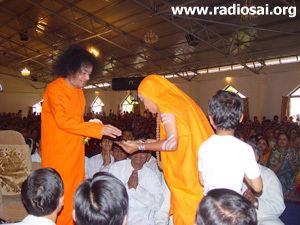 The love with which she treated these women blossomed as she watched Swami healing the stricken. He showered compassion on them and applied vibhuthi on their brows. When they were restored to normalcy and returned home, Swami used to narrate the reasons why their thoughts went awry and their words were soaked in spite. Listening to Him, Easwaramma decided that she would not condemn or ridicule any woman on the basis of her apparent faults or failings for they were only, she knew, the results of persecution and poverty. The Mother thus became more than their own mother to a growing number of sisters in distress. Mother possessed a rich spring of native wisdom (medha) with which she quenched the thirst of the desolate and deprived. She not only knew the simple folk remedies for physical illnesses but also many "psychotherapeutic strategies" (to use an aristocratic word) that could demolish depression and remove fear from the minds of those who came to her. They often confided to her what they would not tell their own mothers. Her sympathy in listening unlocked the chambers of their hearts wherein their agony was interned. She tolerated the long narrations, never evincing impatience, boredom, or judgment, and the teardrops that shone in her eyes were sufficient to drown their distress. She was happy beyond words that Swami accorded such an honored status to motherhood. During the Nine Days of Dasara celebrations in Puttaparthi women gathered in the Prayer Hall every morning and evening to worship the Cosmic Feminine as Goddesses Durga, Lakshmi, and Saraswathi. Mother was also pleased that women were permitted and encouraged to recite the mystic syllable OM. In truth, the taboo was so inculcated in womenfolk that they had never dared to challenge it. Mother felt that women should not be denied access to the presence of God, and if OM is the purest sound and symbol of the Impersonal, women also had a right to invoke it.She told Swami how happy she was at this, his singular Blessing to women of all castes and races. There was another event that was planned and consummated at Puttaparthi by Swami early in 1968 which touched her motherly heart and brought her immense satisfaction – the Optical Diseases Diagnosis and Treatment Camp which lasted ten days. Four thousand patients were examined and more than a thousand operations were performed to restore vision to those blinded by cataracts, glaucoma, etc. Groups of old men and women led by their children and grandchildren came hobbling along the village roads to the Nilayam. Easwaramma had never realised how many there were in need of the help Swami offered. There was great enthusiasm among the devotees, men and women, to serve them. More than a hundred women devotees volunteered to nurse the female patients and Easwaramma was with them, elated at the promise that awaited the sightless multitude. The Mother was at ease and full of joy as thousands of indigent and ailing villagers were fed and clothed, repaired and rehabilitated. Easwaramma was born in such a poor family that she did not even have proper food to eat. All that she had to eat was ragi sankati (gruel prepared from a coarse grain). Easwaramma was illiterate. When I see the egoistic attitude, perverted mentality and ostentatious behavior of the present day educated people, I feel it was better that Easwaramma did not have any schooling. When I was seven and a half years old, I used to teach Pandhari bhajans to small children in our village. Easwaramma and Subbamma used to feel ecstatic watching Me sing Pandhari bhajans and dance to their rhythm. Sometimes her husband Pedda Venkama Raju would give Easwaramma some money for the household expenditure. Once two annas were remaining with her out of this money. One could buy two bags of puffed rice for two annas in those days. So Easwaramma bought two bags of puffed rice with the two annas and distributed it to the children. She always used to give away whatever she had with her. She was the embodiment of sacrifice. She would talk lovingly to all those who came to her. When devotees would feel sad that Swami was ignoring them, she would console them saying, "Whatever Swami does is for your own good." There are any number of instances when Easwaramma was unable to bear the suffering of a devotee and went straight to Swami and pleaded on their behalf. If ever she took any liberty of her accessibility to Swami, it was for the sake of some distressed and disconsolate soul. In one instance there was a couple from West Godavari who had come with a terribly sick child and had waited in Puttaparthi for a week. Due to financial constraints they were not in a position to extend their stay and were about to leave crestfallen. As a last resort they met Easwaramma, and when the Mother heard their plight she took the boy by his hand and immediately led him upstairs to Swami's room and pleaded with him to cure the child. Swami gave her a patient hearing and then calmly said, "Chustanu" meaning, "I will see." But no, she was not satisfied and insisted that Swami show mercy to the poor family now…and Swami finally gave in to her prayers and healed the child. As is said, a mother's prayers never go unfulfilled. 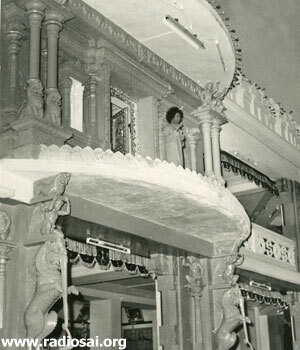 After the Prashanthi Nilayam Mandir was constructed, the Mother who did not want to miss an opportunity to be beside her son chose to live in the Prashanthi temple itself. This was a boon for the devotees for they benefitted immensely from her comforting advice, caring counsel, and ever-ready-to-help attitude. She was accessible to all and devotees found in her someone genuinely interested in their welfare. In those days entire families would come to Puttaparthi and as the Mother interacted freely with everyone, they would confide in her their problems and worries to such an extent that she brought twenty members for an interview. Swami had graciously permitted the family to perform Padapuja (worshipping the feet of the Lord with rosewater, flowers, etc.) to him. As they did the ceremonial rites, they beseeched him to grant them the opportunity to perform Puja to Mother Easwaramma, who was seated beside him. Swami initially refused saying, "No. Do not call her as she will start recommending," but the devotees persisted until Swami gave in and Mother Easwaramma reluctantly acceded to their request. All the while the Puja was going on, Mother was intently watching the members of this family from West Godavari and as predicted by Swami, she started "recommending" saying, "Swami, that boy does not study. Please give him vibhuti so that he gets good marks," and "Swami, look at that poor girl. She has been suffering so long. You must cure her," and so on. That was the beauty of her goodness. Easwaramma met untold numbers of devotees who would cry out their heart to her and pour forth their sorrows. She would listen patiently and not only remember their problems in detail but bring them to Swami's notice whenever she found an opportunity. On Ladies Day in 2002, Swami acknowledged this noble trait of Easwaramma. Griham Ammayi, the mother of this body, used to speak to all with love. She could never withstand the suffering of others. She would come upstairs and plead with Me, saying, "Swami, they are in a sorrowful state. Please call them and talk to them." Her heart was filled with compassion. That is why her fame has spread so much. In order to attain a good name you have to utter sacred words and help others. Whenever Mother Easwaramma came to Me with such a plea, I used to pretend to be angry and chide her, saying, "Why are you coming here with recommendations? I don't want to listen to them." But she would persist and continue to plead, "Swami, please take pity on them. They are in dire need of Your help. Please talk to them once." I used to be happy thinking, "How compassionate and kindhearted she is." Truly, she had a heart of gold. Never was there even the slightest trace of ego in her that she was "The Divine Mother." She mingled unselfconsciously with everyone like any other simple village lady and shunned special recognition, undue attention or publicity. In the late 1960s there were a few brick houses situated around the Mandir. One morning, a lady who lived alone in one of these structures was burning charcoal for cooking when the smoke overwhelmed her and she fainted and fell unconscious to the floor. When she did not come out by 10:00, some people sensed something amiss and broke open the door to find her lying unconscious. When this information reached Swami, he was far from pleased and told the devotees, "It is one's duty to know the well-being of one's neighbours. The least one can do is inquire how they are, what they need and the state of their well-being. Every day when you get up, find out how your neighbours are. This is a pleasant thing to do in the morning." These words of Bhagavan touched Mother Easwaramma's heart. From that day onwards she took it upon herself to go to each and every house in the morning and personally find out whether all were comfortable. Once it happened that the Mother was on her daily rounds, checking from house to house as to whether everything was fine, when she tripped over a pile of bricks and sprained her leg. She was in acute pain and unable to even stand. 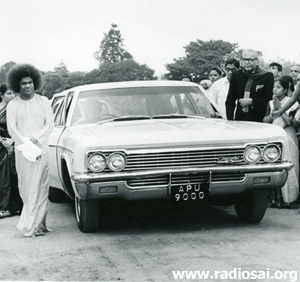 Immediately some devotees took her to the nearest house and the message was relayed to Swami, who rushed to her and jovially asked, "Why do you have to move like this to every house unnecessarily?" She replied, "Swami, nothing is impossible for you. You can get all the work done without going anywhere. But such a thing is not possible for me." Swami merely smiled, created vibhuti and said the pain would soon stop. The next day she was fine. The genuine love that Mother Easwaramma had for devotees was something very laudable.She spoke sweetly at all times, her speech emanating patience and forbearance and fully free from pretense with no sharp edges to hurt the hearer. 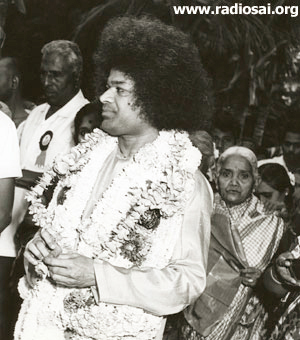 During the time Swami was still at the village Mandir, there were many women apparently "possessed" by spirits who were brought to his presence by distraught relatives. The unfortunates screamed, sulked, moaned, and ran helter-skelter. Sometimes their condition had been aggravated by quacks who had treated them with the rod. Easwaramma offered the soothing balm of sympathy to the victims and a few minutes with her was an effective tranquillizer which calmed their explosive emotions. Whenever people called her Mother, it was with quivering lips and tears glistening in their eyes. 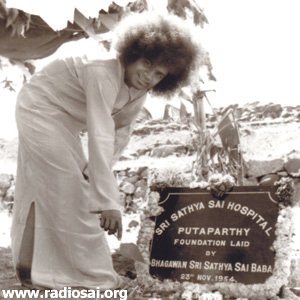 There is perhaps one legend that will always dance around her hallowed name, and that is her direct inspiration for the mammoth social service projects which make the name Sathya Sai shine throughout the world. On several occasions Swami has recalled this endearing facet of her life. Once she told Me, "Swami, our Puttaparthi is a small village. Since there is no school in this village, the children are forced to walk long distances to attend schools in the neighboring villages. I know that You are the ocean of compassion. Please construct a small school in this village." I asked where she wanted the school to be built. She said she had a piece of land behind her house. She wanted the school to be constructed there. As desired by her, I got the school constructed. 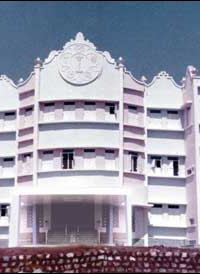 Though it was a small school, the inaugural function was a grand affair attended by many devotees. The next day Easwaramma expressed her happiness over the inaugural function and said that she had one more desire. She wanted a hospital also to be built in the village. She said, "Swami, I don't want to put You to trouble. If You are troubled, the whole world will be in trouble and if You are happy the whole world will be happy. So if it gives You happiness, please construct a small hospital." As per her wish, I got the hospital constructed. 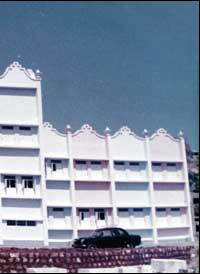 Bejawada Gopal Reddy, a highly reputed person in those days, was invited to inaugurate the hospital. The inauguration was attended by thousands of people from the neighboring villages. Easwaramma did not imagine that this would be such a grand affair. Next day, she came up to Me and said, "Swami, it does not matter even if I die now. I have no more worries, you have fulfilled my desires and mitigated the suffering of the villagers to a great extent." I said, "If you have any more desires, ask Me now." She replied hesitantly that she had yet another small desire. "You know that the river Chithravathi is in spate during the rainy season. But in summer it dries to a trickle and people do not have drinking water. So, please see that some wells are dug in this village." I told her that I would not stop with these small wells and that I would provide drinking water to the entire Rayalaseema region. Easwaramma said, "I don't know what Rayalaseema is. 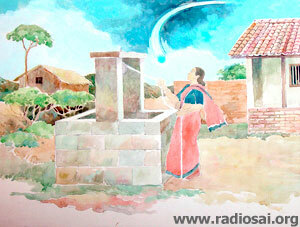 I am satisfied if our village is provided with drinking water." The Mother was perhaps the person most gratified when Swami announced that a twelve-bed hospital would be raised on the hill to the south of the Mandir. For her part, while Swami was at the village Mandir and even later, she could avail herself of the expert medical advice of Dr. Lakshmi, the famous physician and gynecologist from Nellore who stayed for weeks in the presence of Swami. Whenever she, her daughters, or others of the Ratnakaram family received the kind attention of that doctor, Easwaramma prayed to her to examine, diagnose, and prescribe medicines for other village women too. She longed for a lady doctor who could stay at the Mandir year in and year out and help women in times of dire need. So when the news of the hospital came to her, she was overjoyed. Easwaramma joined the women devotees hauling sand, stone, bricks, and cement from the road up to the construction site and lifted bricks herself, brushing aside protests from the women. When the wards were ready, she sought out women patients, brought them to the doctor, pleaded that they be admitted, and looked after them until they could move about and take their normal share in the work at home and in the fields. Dr. Jayalakshmi, who served in the Sathya Sai Hospital, related that Easwaramma was a pioneer in serving pregnant women and babies. She advised against magical rites and the offering of fowls and lambs to Maariamma and lesser deities to drive diseases away. She sat with the patients while they were questioned, waited for the diagnosis, and held them firm as the dreaded needle was administered. When ladies were admitted as patients, she climbed the hill to the hospital to make sure they know there was a Mother interested in their recovery. Pedda Bottu, who knew her well, was warm in her admiration. "She had no trace of envy and she never relished scandal. Her speech was sweet with affection and compassion. Her complexion of gold-brown, the eyes collyrium bordered, the magnum dot of kumkum shimmering on her broad brow, they all reminded us of the popular image of the Goddess Lakshmi." Devotees prostrated whenever they chanced to meet her and sought to earn her maternal blessings. Her wide eyes gleamed and her toothless mouth was half-open as she smiled in recognition, satisfaction or appreciation. They spoke to her in various languages and received her reply in the one tongue available to all on such occasions – the language of the heart. The devotees discovered in the Mother a never failing source of strength and wisdom. They sought her out more and more often and honored her as the Mother, assigning her distinct roles during festivals and holy days. Easwaramma did not yield as soon as the women surrounded her and pleaded that she should guide them or bless them, but how long could she keep them at bay? On days dedicated to the worship of Varalakshmi (the Goddess of Wealth ready to grant boons) or Gowri (the fair Consort of Shiva, mother of Ganesh), she had to accept the first offering of homage from every woman who needed her. During the nine days of Navarathri, the Festival of the Mother, she was honored for the first three days as Durga, the next three days as Lakshmi, and on the last three as Saraswathi. During these days Swami directed the women devotees to assemble at the Prayer Hall of the Nilayam every morning and evening to worship the Mother Goddess reciting the 1008 Names which attempt to capture a glimpse of her Glory. Easwaramma vehemently declined to be installed on this occasion as the visible symbol of the Divine Mother. She even wriggled out of participation since the women insisted that she must at least be seated at the head of the row. She preferred to enter unannounced, sit through the ritual unnoticed, and slip away quietly. Such was her humility. But on the Jhoola evening she had to yield to their wishes. Swami's darshan while on a floral swing was the valedictory event in Navarathri. Women devotees offered fruits, flowers, and sweets and arranged lamps in attractive patterns before him. Arati would be offered when he came off the swing, so when Swami indicated he intended to leave and the camphor flame should be readied, a series of lamps were waved before him by women singing traditional lilts. Easwaramma was then sought out and brought to the Nilayam to wave the first Arati lamp, despite her protestations that the privilege must be granted to someone else who was more devoted and deserving than she was. Every Hindu child has his "birthday" celebrated at home as a festival with extra prayers and special offerings of sweets to the family deity. The child is seated facing East on a sanctified plank. The mother pours a few drops of oil on the head and others follow her. The child is given a ceremonial bath and dressed in new clothes. He has to touch the feet of elders and sit in the shrine while prayers are offered by the parents for his long life, health, progress, and prosperity. 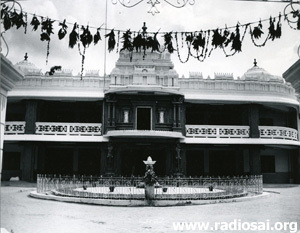 Prashanthi Nilayam was inaugurated on Swami's Birthday in 1950. Previous to that year, the Birthday had been rather informal. 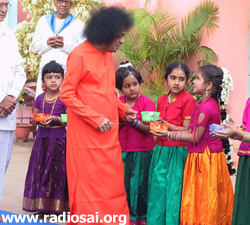 Swami delighted the Mother and the Father and their sons and daughters by visiting their home and going through the ritual of lunch in their company. 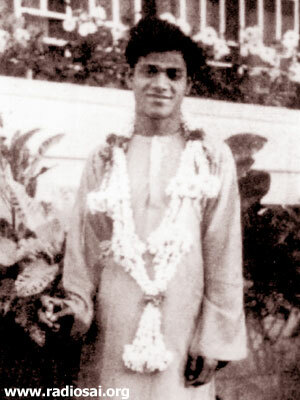 After the parents had placed a few drops of oil on his cluster of hair, the ceremonial bath was administered and Swami fulfilled the longing of one devotee by accepting the robe and dhoti he placed at his feet. All those present then touched his feet praying for boons and blessings. 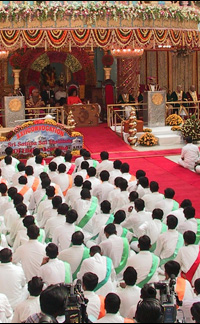 The new Prashanthi Nilayam, however, challenged the devotees to inaugurate a more impressive though still intimate celebration of the birth of their Lord Sai. Elderly women gathered at the Nilayam in the early hours of the 23rd of November. Each one had a plate with piles of flowers, fruits, sweets, coconuts, turmeric, kumkum, rice grains, betel leaves and areca, sandal paste, blocks of jaggery, glass bangles, and other auspicious materials. Shining pots filled with consecrated water were carried on their hips. One of the group bore a silver plate with a silk sari upon it. A few elderly men joined them with a silk dhoti for the Father and they proceeded to Puttaparthi village preceded by pipers and drummers. When they reached the Ratnakaram home, they announced to the parents that it was the Birthday of Bhagavan and invited them to Prashanthi Nilayam. One could sense their awkwardness for both of them would rather be left alone than placed before the floodlights on the center of the stage. 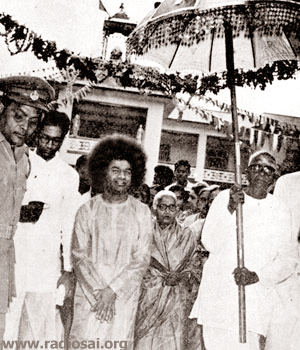 Nevertheless, the Mother and Pedda Venkama Raju satisfied the wishes of the thousands present and were themselves filled with gratitude for the opportunity given to them by Swami. As soon as they stood before him they lost all sense of time and space. Easwaramma placed flowers on Swami's feet and stood up to dip a rose in oil. When she lifted her palm to drop the oil on the son's hair, he bent low so that the head would be within easy reach.The father, too, did the same and as both of them descended from the dais, the devotees hailed the occasion, expressing their joy in loud acclaim. It was only then that Easwaramma became aware of the hall and the crowd, the Nilayam, and the village. It was an embarrassing moment for her but she was soon relieved, for she found another wedded couple climbing the steps to place flowers at Swami's feet and apply oil on his hair. 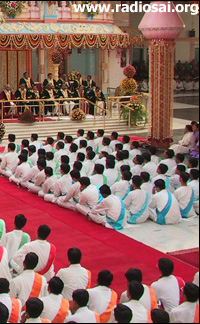 Swami used to select about eight others from different linguistic and geographical regions to share in the joyous ceremony who were invariably old in age and rooted in faith. Easwaramma shunned publicity and prominence and preferred to lose her identity in a group of devotees, but on the Birthday she had to submit to what she dreaded most – a public and preeminent role. Humility was her very nature and publicity anathema to her. 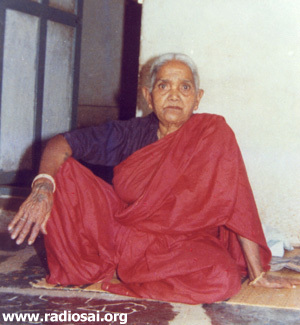 Easwaramma's humility was no empty pose. She was very shy before the camera and argued persistently against being photographed. This was not the false humility that parades itself to draw attention to the possessor of that virtue. Many are proud that they are not proud and protest against praise but are secretly sad if it is denied. But Easwaramma was temperamentally allergic to the limelight. She was raised in a cloistered hamlet and stuck to the boundary stones her forefathers set up to demarcate the fields of feminine activity. Fate brought women from all the corners of the world, speaking a hundred languages, as well as from all castes, classes, and creeds to her door. She let them come and speak what they wished but seldom sought to know what their words meant, for as she confessed, "Why bother yourself with wishes you cannot fulfill and problems you cannot solve?" 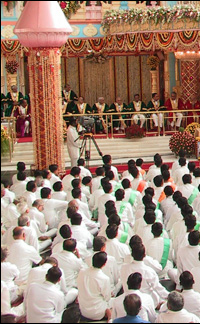 She had no desire to mislead visitors that she had special access to Sathya Sai and could extract his grace for them. She was aware that there were millions who deserved his grace and that she was only another candidate seeking to qualify. Easwaramma possessed the age-old reverence for the husband which prescribed mutual distance and silence and proscribed joint appearances on the same seat or even the same room. She retreated into the inner apartments whenever Pedda Venkama Raju was around and avoided all chances of a dialogue. 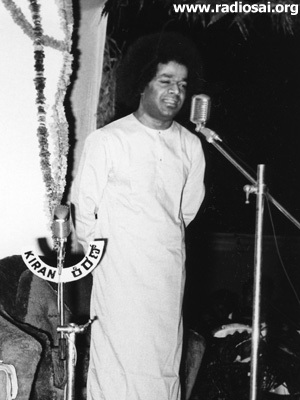 But as an obligatory duty, on Swami's Birthday they submitted to the demands of the devotees and allowed themselves to be honored as the Parents and to be taken in procession to the Nilayam. When she traveled to Badrinath and Benares with Swami, in accordance with the ancient injunctions, the sacred idols had to be offered worship by the husband and wife together. In fact, the absence of the wife might even annul the fruits of the worship. Every gift made by the man has to be endorsed by the woman. He holds the coins in his hand and waits for the wife to pour some water on them before they are handed over. On these and all other occasions, Easwaramma was the model Hindu wife. The piousness and politeness of Easwaramma apart from her devotion to the Lord won the love and respect from the women of the village and those who cultivated the lands of the Rathnakaram family. Every Saturday, she visited the Hanuman temple along with the other women of her age. The idol of Hanuman had been installed centuries ago as the guardian of the fort that enclosed the village. On Mondays, the day dedicated to Shiva, she offered worship at the Shiva temple and whenever possible, visited the Venugopalaswamy temple too. Easwaramma would never boast about her status as the mother of Sri Sai. 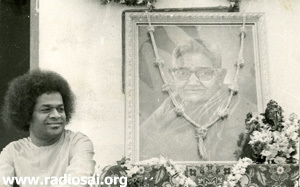 Swami has oft said her simplicity and humility are an example for all of humankind to emulate. Like the other devotees, she addressed Bhagavan as Swami and was full of reverence for him. It was these virtues, along with her golden heart, that made Easwaramma so very special. And Swami too rewarded her with many beautiful experiences. 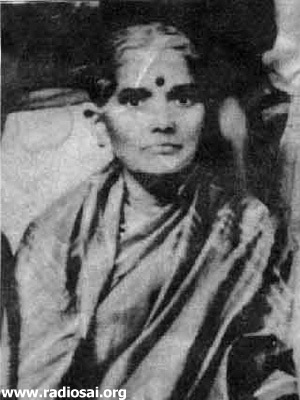 …From that day onward, [after Kondama Raju's demise] Easwaramma never stayed at home and started staying in Prasanthi Nilayam. 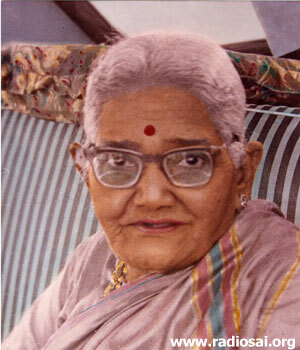 Every day, in the morning and evening she used to come upstairs and talk with Swami. She also understood My Divinity very well. When I appeared in the form of Lord Shiva to her, she would ask, "What Swami? Why are you adorning the snakes around your neck?" I would act innocent, "Well, I don't have snakes on Me." She would move away saying, "Look, there are some snakes inside." But later, on not finding any snake inside, she would ask for forgiveness. Like this on many occasions she had the experience of My Divinity. ‘In a dream?' I asked, ‘No,' she said, ‘He really did come to me when I was rolling restlessly in bed. 'Ammayi, how do you feel?' He asked. ‘My whole body is aching,' I replied, looking up at him. Then what can I tell you? It was not he that you and I know. It was Ramachandra with Kireetam and Kodandam (Crown and Bow)! I raised my folded hands and struggled to sit up and get out of bed. But in a few moments he became Swami again, gave me Vibhuthi Prasadam and said, ‘The fever will go,' and went." It was the day before her passing away and I suddenly asked her, in the midst of casual conversation, "Tell me, is there anything else you desire?" She said, "I have finished my pilgrimages to all the temples. I have seen the biggest temple of all and the God that resides there. I have no desire for anything more." But I knew that a small wish still lurked in a corner of her mind – she wished to give a gift to a granddaughter on her birthday. So I insisted that she should accept Rs. 500, go to the bazaar and buy whatever she wished. I sent her along with a companion and she returned happy with what she had bought. 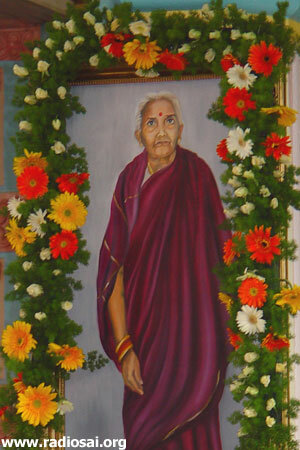 This day is Easwaramma Day. The significance of the day is that it is celebrated as Children's Day, a day when little children are to be reminded of the ideal, a day when she presented an ideal. No one can escape death, but the aim of everyone should be to remind oneself at the time of death of the divine or have some holy or sacred thoughts. The importance of this day is known to many. There is a saying in Telugu: "The proof of the good is the way they die." Genuine devotion is evidenced during the last moments. I shall point out a small incident concerning the goodness of Easwaramma. The summer classes were on at Bangalore. In the morning at 7:00 breakfast had to be served to the students. They went round with Nagara Sankeertan and returned at 6:00. I gave them Darshan at its close. Then I went for my bath. Meanwhile, Easwaramma had finished her bath. She drank her coffee as usual quite happily and took her seat on the inner veranda. All of a sudden proceeding to the bathroom, she cried out, "Swami, Swami, Swami!" At this, I responded, "Coming, coming." Within that period she breathed her last. What greater sign of goodness is needed? She had no need to be served and nursed. Swami will come to the memory at that time only for a very few. The mind will usually seek and stay on some object or the other, some jewelry or valuables. From the ground floor she called, "Swami! Swami!" I replied, "Coming, coming," and she was gone. It was like the elephant's calling (Gajendra of Indian mythology) and the Lord proceeding to bless it – the two wires achieving connection, the release happening instantaneously. This is the authentic consummation that life must strive for. Beside her at the time she had her daughter Venkamma and her granddaughter Sailaja but she called out only for Swami. Getting this yearning at the final moment is the fruit of holy purity. It is the sign of an ideal, adorable life. Such attitude must emerge of its own accord and not by means of some external force. Here is an example to learn from. Truly, the whole life of Easwaramma is a shining example and ideal for Sai devotees to emulate. "Amazing love for Swami and constantly seeking happiness and welfare of others" – this is the summary of her life. She had a special love for children because in every child she saw Sathya hiding, inviting her to seek and succeed. Naturally, they cuddled in flocks around her. They watched with delight the twinkle in her eyes and the wrinkles on her cheeks and chin as she joked and laughed. They were amused and their attention was aroused when her gold and glass bangles jingled as she gesticulated, while stressing a point or underlining a caution. When she found a child chubby, she squeezed and pulled its cheeks to see the patch of pink, the thrill the impact lent to the angel face. She could be easily inveigled into the narration of hair-raising or heart-warming tales in order to keep the children wrapped in excitement. Her pleasing pliant voice reproduced the screams of the kidnapped heroine, the wail of the wounded demon, the plaint of the frightened son, the roar of the victorious warrior, and the crooning of the child cast on the jungle track. In fact she was quick in adding to her repertory stories about Sai Baba of Shirdi and Swami. The children watched the pictures she so realistically designed and described – the white umbrella with tassels of gold held over a pair of sandals, the emergence of the lion-faced God from the marble pillar of the royal audience hall, the dance of the child on the hood of an angry serpent. Easwaramma forgot her physical ailments, the deeper deprivations, and the assaults on her inner peace when engaged in storytelling. Invariably she rounded up the tales with emphatic words on humility and honesty, love and loyalty. These lessons were lapped up by the children for they were soaked in the syrup of her affection. She appreciated the earnestness and enthusiasm of the young. Her grandsons were a bright lot and she insisted that they join higher classes and educate themselves to the utmost. She loved to encourage the sons and grandsons of others, too. She prevailed upon Swami to agree with her choice and send money to them to meet their tuition fees and the cost of books and boarding. She felt pained whenever she discovered that the dispatch had suffered delay. "The boys cannot study well now," she used to say, "they will be too worried to read in peace." When she found that a name had been dropped because the boy had left school, she tried to persuade the parents to keep him enrolled. 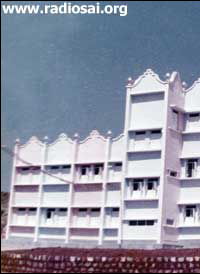 To immortalize this warm love and moving concern she had for children, Swami established the Easwaramma High School within two months of her passing away in Puttaparthi. Every year hundreds of village children graduate from this school confident and conscientious to pursue higher studies and make their parents proud. 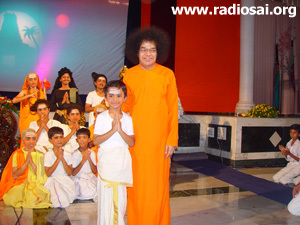 May 6th is also celebrated as Children's Day in all Sai Organizations throughout the country. Bal Vikas groups in every Sai Center perform songs, dances, and value games glorifying God and expressing their gratitude to the blessed Mother for having gifted them with the most precious possession of their lives, their Swami. 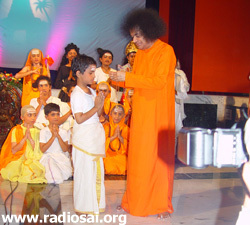 In the divine presence too every year small children perform various plays and Swami lovingly showers them with gifts and love after their presentation. Once, on Shivaratri day, after I had completed My discourse and the Lingas were ready to emerge from My mouth, I sat on the chair and was in severe pain. Seeing Me suffering, Easwaramma got up from the gathering, came up to Me and said, "Swami, why do You suffer like this? Come inside, come inside." I said I would not come inside and rather than watch My suffering, she went inside. As soon as she left, Hiranyagarbha Linga emerged. All the devotees burst into thunderous applause. Hearing this, she came back, but by then the Linga had already emerged and I was showing it to the devotees. All the people got up to have a glimpse of the Linga. As a result, Easwaramma could not see it. Next day she pleaded with Me to show the Linga to her. I said I had given it to somebody. But she said, "Swami, I have not seen. I want to see." I told her that she would see in the future anyway. She said, "I do not want to put You to inconvenience," and went away. She never had put Me to trouble any time. Whenever she asked Me for something she would come back and ask if she had given any trouble. To all the devotees who came she used to entreat not to cause any inconvenience to Swami. She used to be very much worried whenever any minister came to have My darshan. The situation in those days was such that even a policeman with a red cap was enough to frighten the villagers. Easwaramma used to be very much afraid of the ministers, thinking that they might cause some problem to Me. This was only the result of her sacred love for Me. You may be aware or not, but even after thirty years of her passing away, Mother Easwaramma continues to express her love for Swami in a number of ways. Even to this day, she moves around in her physical body. At times she comes to Me and expresses her motherly concern for My well-being. Once she cautioned Me not to accept a handkerchief from everybody. I told her that I had to accept when people offered it with devotion. She said, "Swami, no doubt there are crores of such noble persons. But there are also a few evil-minded persons who may smear poison on the handkerchief and offer it to You. This can prove dangerous when You use it to wipe your lips." I promised her that I would follow her advice. Even to this day she makes her appearance in My room. The boys who sleep in My room have witnessed this. Whenever she comes and talks to Me, they sit up on their beds and listen. One day I asked the boys for a belt to keep the silk dhoti tight around My waist. The belt they gave Me had a shiny buckle and could be seen through the robe I wear. I did not want to use it lest people should think that Sai Baba wears a gold belt. After this, one day Easwaramma came to My room early in the morning and started talking to Me. Then Sathyajith, Sainath and Srinivas woke up and wanted to know with whom I was conversing. They wondered how anyone could enter My room since the lift was locked and the key was with them. Then I told that Griham Ammayi [Mother Easwaramma] had come. I showed them the belt that she gave me. It had no buckle. There are many such noble mothers in this world but Easwaramma was the chosen one. I chose her to be My mother [cheers]. That is the intimate relationship between Mother Easwaramma and Myself. So that is how intimate is the bond between Swami and Easwaramma. No doubt the crown of motherhood was acquired by Easwaramma as a reward for her accumulated goodness but in this life too she rose to those heights which made a laudable example of a great devotee of the Lord. Her love for him was unparalleled and as well as being an ideal wife, sister, mother, and grandmother, she was a constant source of support, inspiration and love for the village folk and the ever-expanding Sai family. The Lord chose her as his Mother not only as a reward for her past deeds but also, as Prof. Kasturi noted, "in appreciation of what she was capable of in this life." And with the Supreme Teacher to guide her, she learned every lesson Swami gave her with his glance, a word, a question, or a smile, and became a living saint radiating love and purity. Ultimately, the great soul we know as Easwaramma reached a state where she took every event and emotion, every thought and activity as a gem set doorway through which she could cognize the One. Most of the content for this cover story is taken from Prof. Kasturi's book Easwaramma - The Chosen Mother. We have also interacted with several long time devotees of Bhagawan and integrated their experiences into the story. Best Resolution 1024x768 -- Copyright © 2004-2015 SAIBABA.WS. All rights reserved. Please read Disclaimer.